← Resource Calendar and weekend! 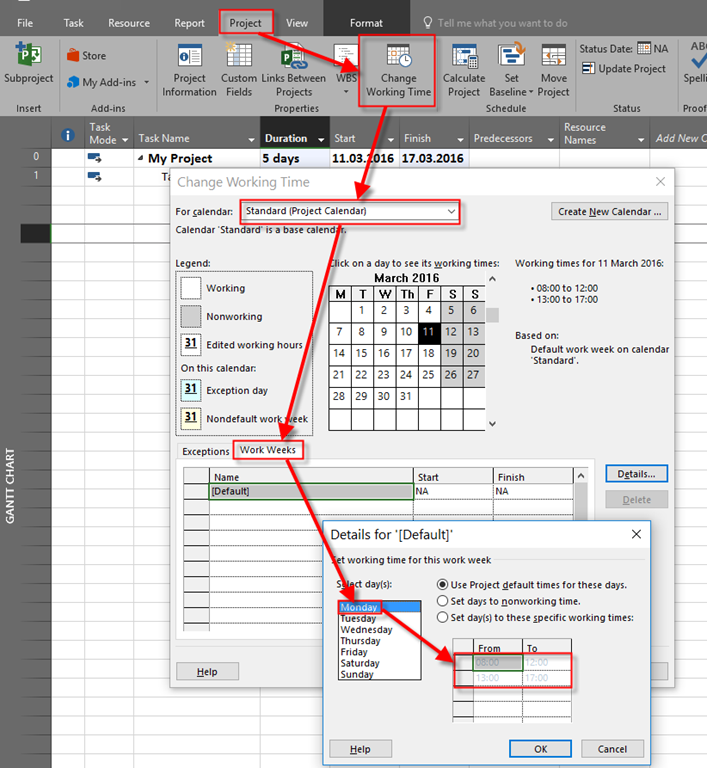 If in the example you just presented you change a task default calendar’s option None to Standard (Task Information>Advanced<Calendar), the resource John will no longer be scheduled to work on the weekend days 12/03/16 and 13/03/16, and the task will be scheduled as if no exception in John’s calendar for these 2 days making them working for John was made at all, and the task will be finished on 17/03/16 instead 15/03/16. Why? 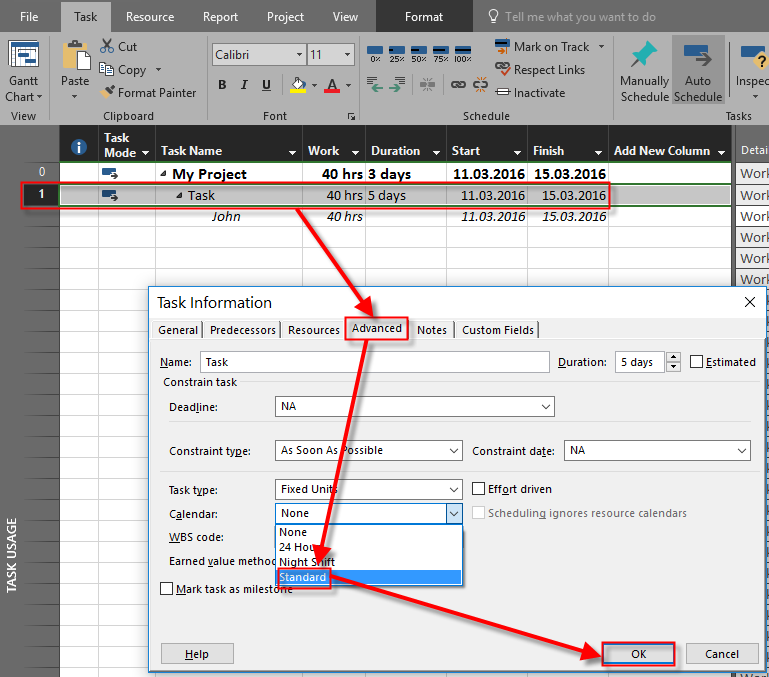 In my understanding the default task’s calendar option None is referenced to a default Standard Project calendar, so why MSP behaves differently when you leave a default None for the task’s calendar and when you select a Standard calendar instead, even though the two are exactly the same calendar- Standard Project Calendar? First I’m going to create Scenario for this Case in MS PROJECT 2016, and then I will explain it. I will repeat whole previous post, and I will add the explanation for this particular question! First of all those Calendars are not same. When I put exception for John, this exception is valid only for John. So, for example if I put Mary on this Task, instead of John, and Mary doesn’t have this exception she is not supposed to work during this particular weekend. So, where is difference? For example if I have a Task and John will work during the weekend, and Mary will not, and if assign only John to this Task it will take shorter (because he will work during the weekend), than if I assign Mary to it. But if I declare to the whole Standard Calendar that this weekend is working weekend it will apply to all resources (John and Mary, as well) because Task Calendar has the top priority. 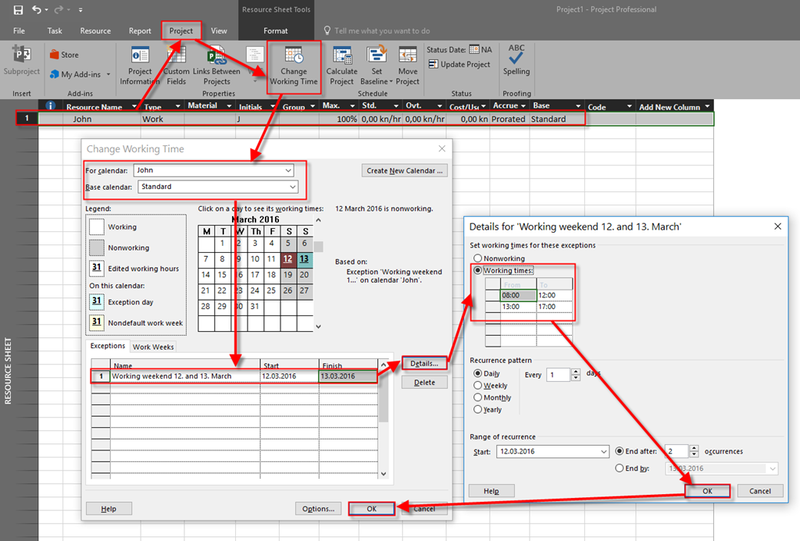 This entry was posted in MICROSOFT PROJECT, Microsoft PRoject 2010, Micsrosoft Project 2016, MS PROJECT 2016, PMI, PRoject Management and tagged Micorosft Project 2016 - calendars, MS PROJECT. Bookmark the permalink. Could you please help me with a question on resource calendar? If a resource is part time only work 3 days a week. I need to assign this resource 1 day for Project A and 2 days for Project B. What is the best way to set in MSP? 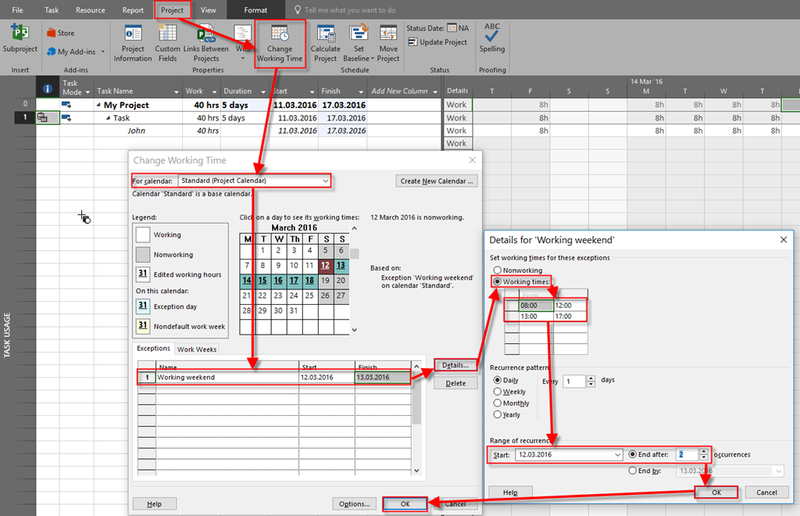 Shall I set maxium unit 100% and then use resource calendar to adjust the part time 3 days or Shall I set the maxium unit 60% and then use Task calendar to adjust the allocation?